The purpose and goal of Frack Free World (FFW) is a global ban on the hydraulic fracturing method according to the charter and the best possible coordination of the global antifracking network for this purpose. FFW has a grass roots structure with the preferred option of grouping together two larger groups, namely a national coalition and a continental coalition. In particular, the activities of the continental FFW coalition will be coordinated by the World Brain Trust (WBT). The WBT consists of the FFW management (MFFW, hereinafter referred to as “M”) and the scientific council (SCFFW, hereinafter referred to as “SC”). See the attached graphic structure of FFW. If a national coalition is established, one representative acts on behalf of the State towards the FFW, namely the national coordinator. If in the State there is only one or several independent groups (not in the national coalition) then the national FFW coordinator is chosen from among them. In such cases, they have only an advisory role towards M, and M may, but does not have to, accept them as members of M up until the continental coalition is established. If the continent is unified in the continental FFW coalition, it shall send (based on the continental general meeting) a continental coordinator to the MFFW who automatically becomes a member of M.
FFW activities are coordinated by WBT via recommendations. WBT notes that national or international independent events and activities emerging and coordinated separately from the bottom up or horizontally are not affected and are sovereign. Their coordination with the aid of WBT is possible with the consent of the entity. The identity of individual groups, national and continental coalitions inside or outside FFW is not affected and has all sovereignty according to local requirements. 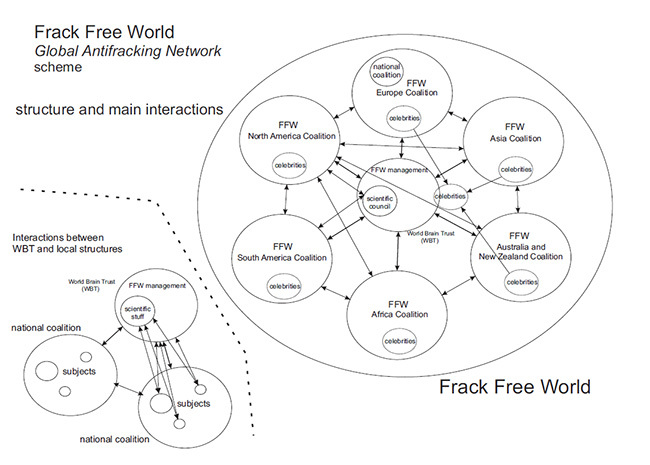 Coordination of the global FFW network with the aid of WBT is meant to be analogous to a council of “elders” and gains either natural respect or not, based on the understanding of its proposed procedures. M has its part of the website with news for coordinating and timing of global and continental events. SC members are chosen on the basis of recommendations of the continental general meeting and the approval of M. Preference is given to uniform continental representation of scientists in the SC and their number is not limited. If there is no continental coalition, M and SC by agreement with the continental groups shall determine which scientists may join the SC. Scientific council members have an advisory role towards M. The voting procedure of the scientific council and M is determined by the respective entities, preferably by consensus. Coordination of FFW with the aid of M must be performed in accordance with scientific truth (which SC looks after). Access for informing all stakeholders of SC (and for groups outside the FFW structure) is guaranteed. SC is committed to continually update the scientific knowledge about the HF method and its impact, as well as its development and shall take care to notify M and the entire network of the latest developments. For this purpose the scientific council shall have its own part of the FFW website. It will be advisable to divide the SC into sections: geology, chemistry, legislation, political science, economics, biology, biochemistry, oncology, toxicology, hydrogeology, hydrology, seismology. Acquisition of new entities is treated according to the registration sheet. The continental coordinator appoints national administrators to manage the relevant sections of the website, which receives administrator rights from M within the week of being appointed. The national administrator ensures the maintenance of national news and the up-to-date status of HF in the State. This section shall improve the information on the state of the world on HF and necessary feedback for coordination, not only for the WBT. Updating this section is crucial to the operation of FFW. At least one month in advance, based on the national coordinator’s proposal, who consults the continental coordinator on this step, a national or continental event shall be announced such that M may have sufficient time to organize and coordinate assistance, and so that the time does not conflict or fall at the same time as events of other countries or continents. Before full functionality of the optimal state of the network structure according to the statutes is achieved, the founders of the Beroun Call to Action 2013 shall establish a preparatory committee substituting the activities of M and SC from existing, tried and trusted resources, within the meaning of the statutes. Once the status of a full decision of the WBT is reached, the preparatory committee will be dissolved and section 9 of the statutes will be deleted. Fundraising shall be for the operation of FFW and to support the continental, national and local campaigns and to promote research methods. All financial transactions would go through the accounts and central records shall be kept. (Note: This will be dealt with at the first FFW general meeting. It would be worth opening a separate bank account which in turn could finance the green sector on the planet). This is a preliminary draft of the statutes and may be amended and approved at the first general meeting.